Guiyuan Pagoda is located in Hanyang , Wuhan City and was built in 1658 on an area 20,000m2 by Bai Guang Buddhist on the base of Sunflower Garden owned by Hanyan poem. 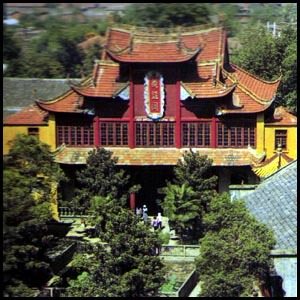 The Pagoda is well known for its grand architecture, well preserved sculture and rich collection of Buddhist sacred literature. Its scripture hall keeps more than 7000 volumes of Buddhist Writings. The Pagoda enshrines a 105-ton white stone Buddha. In the Hall of Arhats, there are 500 arhat statues in full length and with various vivid looks and gestures.